Currently the future is for the intelligent handset where Laptop companies like HP already have Mobile Handset product like Palm, there are a lot of companies that already have the leadership in this domain like Nokia , IPhone (apple) , Android (different companies). In the same time the laptop is still have the power that people need in various prospective and in spite of increasing abilities of handsets still the laptop is important, some companies like Apple released different ways for surfing the net like IPad which have some capabilities of the laptops with less power targeting the people needs between the laptops and the mobiles. Also most of the current mobiles have some ability to connect to the laptop and synchronize with them existing data. The idea is to provide a new product represents the new era of laptops that competes with all existing products. This product is Lapmob instead of laptop.. 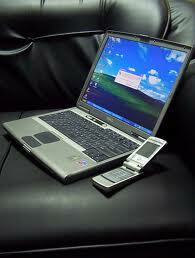 The product is depending on having both the laptop and mobile technologies. The lapmob is depending on having a laptop that contains a box to plug a mobile inside it, and once the mobile plugged a software like Cisco IP Communicator is lunched with all mobile technologies existing (actually have a VM or simulator for the mobile is sufficient) so the lapmob user can do calls, write sms, and run applications in the same way he do in the mobile, if the user want to unplug the mobile he do that smoothly as well. The recommended place for this plug is behind the screen in the right side in a box that has a cover; to facilitate another idea will be discussed after few lines. The idea behind selecting the screen rights side, is to have another product version that have a battery for the screen on the left side of the screen back so the user can unplug the lapmob screen (safely) with the mobile plugged only so the user can have a similar product to IPad to read without having to carry the whole laptop so user can read any books, surf the internet using the mobile connectivity (most mobiles have wireless & 3G now) this version will need touch screen support as well and using mobile operating system and mobile memory card as storage. The screen can stand on its side on any location so it can be used like a DVD player as well. Other alternative is to have the screen rotate and placed over the keyboard part but facing outside. Another option to be included is to have the hard disk pluggable and can be easily plugged off as external hard disk as well. It provides a different combination of features to produce different products where the full version will cover around 4 competitive products (i.e. laptop, mobile, IPad, IPod, MP3 player, DVD Player…etc.). The good thing is the ability to have multiple version with different mixture of feature.